The Photography Show is on, and we've got all the biggest news right here. The Photography Show is now open! The Show is the UK's biggest and best event for photographers of videomakers of all abilities, and this year's show is shaping up to have more going on than ever before. 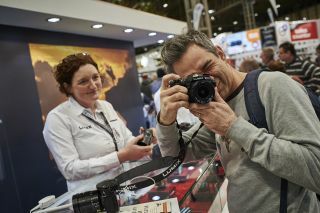 Running at Birmingham's NEC from 16-19 March 2019, the four-day show is packed full of manufacturers and other exhibitors keen to show off their latest products, together with talks from professional photographers, live demonstrations, shooting opportunities and much more. Get tickets for The Photography Show. It will the sixth exhibition to be held at the National Exhibition Centre since The Photography Show first started back in 2014. Each year over 30,000 photographers visit the show, which is run over four days from Saturday to Tuesday each March. After 10 rounds and after judging 60,000 images, we have found our Digital Camera Photographer of the Year, and our Young Photographer of the Year. Find out who they are, and read their stories in our exclusive report from the ceremony at the show. When it comes to smartphones, The Photography Show has add-ons and accessories in abundance. Whether it's gimbals you are after, selfie machines or cases with lenses, there will be something in here to satiate your camera phone obsession. 5 star speaker that you cannot miss! If you are heading to the Photography Show 2019 then these are the 10 things you must do while you are there. This feature showcases the ultimate stands, exhibitors to seek out and the amazing talks and tutorials that will be taking place on the various stages. LED lighting specialists, and makers of the NEO 2 and AEOS lighting panels, has secured £5 million of funding to create its next generation of products. Aiming to convert even more photographers from flash to continuous lighting, Rotolight is promising no fewer than 15 new products. We talk to MD Rod Aaron Gammons ahead of Rotolight's appearance at The Photography Show & Video Show. Tokina has given its 16-28mm f/2.8 full frame DSLR lens a style makeover, improved autofocus, its latest lens coatings and a new ‘Opera’ designation to indicate its high-end performance. This is what we think of it. Nikon’s first ‘pro’ Nikkor Z lens looks set to become a standard zoom for Z owners - we go hands on at The Photography Show 2019 to try it out. We can’t offer any opinion on this camera’s image quality as we were shown a physical prototype rather than a working camera, but we’re very impressed by the way the GFX 100 looks and handles. This was definitely one of the stars of The Photography Show 2019. What's new at The Photography Show 2019? The big news for The Photography Show 2019 is that it will incorporate the all-new Video Show. Videomaking has always been a big part of The Photography Show, but for next year filmmaking will get its own workshops and theatres – increasing the number of free programming at the show. There will be another 150 sessions added for vloggers and moviemakers – on top of the 500 workshops, talks, demonstrations and other pieces of content already offered at The Photography Show. In the new In Motion Theatre, for instance, you can learn about video editing and story telling. And there will be special masterclass programs for those who want to get into shooting movies for the first time. To get you excited about what the show has to offer, here's a number of features that showcase just how great the event, made by the publishers of Digital Camera World, will be. This is something very special. Renowned photographer Martin Parr will be headlining the Super Stage at The Photography Show, speaking about his love for the medium and offering up a look at his new exhibition, Only Human. This is one you simply cannot miss. The Nikon School Stage at this year's show is set to be one of the best yet, with Joe McNally heading up what is shaping up to be a star-studded lineup of UK and overseas Ambassadors. Sony has a full line-up of free talks on its stand this years. Headlining the line-up are Californian surf photographer Chris Burkard, and fellow Instagrammer Ron Timehin. Other speakers will talk about their experiences of switching to and using Sony's ever-increasing family of full-frame mirrorless cameras. Epson is heading to The Photography Show 2019 to head up a number of events and showcase its current line-up of photo printers. Epson will be on Stand E81 for the show. Olympus is at The Photography Show in full force this year, with the likes of Charlie Waite, Ian Berry and other Olympus ambassadors from around the world speaking at the event. The Spotlight Stage at the Photography Show will be a highlight this year, with Lara Jade, Andy Rouse and David Noton headline the Canon stage. If you're heading over, prepare to be thoroughly entertained. They're back! That's right, the Wedding & Portrait and Great Outdoor stages are returning to the Photography Show 2019. They are back by popular demand and are packed with a top line-up of speakers and free-to-attend sessions. It is the 50th anniversary of the Disabled Photographers' Society and they have decided to take their festivities to the Photography Show. Its award winners will be on display on their stand, having transferred from being exhibited at the Library of Birmingham. The DPS will also be selling old cameras and photo accessories on its stand to raise money for the charity's work. Renowned presenter and cinematographer, Gordon Buchanan, of BBC's Animals with Cameras talks about 25 years of shooting nature programs. He will be at The Photography Show 2019, so this is a taster as to what to expect. Leading fashion photographer Lindsay Adler discusses her amazing images ahead of her appearance at The Photography Show. Here she reveals all about how she got into photography and where she gets her ideas from. Ahead of his sell-out talk at The Photography Show, Barack Obama's former official photographer discusses his White House days. In our mini interview , we ask Pete Souza about how many pictures he shot of the Obama administration, and his early years photographing Ronald Reagan. Chris Burkard has one of the best jobs in photography. He's a surfing and outdoor photographer and renowned Instagrammer. Here he explains a bit about his craft, what it's like to shoot in extreme conditions and the rise of social media. Read this interview to prepare yourself for his Photography Show experience. Martin Parr is a photography legend. Here the Magnum Photos photographer speaks about how 'he makes order in a chaotic world' with his photography, how Britain has changed and why it's difficult for him to take holidays. Mr Parr will be speaking at The Photography Show. It's not just photography that will be celebrated at the Photography Show but video too. So much so, filmmaking has been given its own spin-off show. The Video Show runs alongside the Photography Show and will be packed with talks, kit and tutorials to make you a better videographer.